Background/aim: Familial Mediterranean fever (FMF) is diagnosed by fever episodes with sterile peritonitis, arthritis, pleurisy, and erysipelas-like erythema. The relationship between phenotype and genotype in FMF has not been adequately explained. The aim of this study was to characterize the phenotype and genotype correlation in FMF. Materials and methods: Clinical diagnosis of FMF was conducted according to the Tel Hashomer criteria. Pras scoring was used to determine clinical severity. FMF strip assay analysis was used, and the hotspot regions were observed with PCR amplification and automatic DNA sequence analysis method. Results: We showed commonly seen mutations (most frequently M694V) in a study group of 191 patients. The disease severity score of patients with M694V mutation was high on the Pras scoring system. Patients with M694V mutation needed high colchicine dosages to control disease activity. R202Q was the most commonly seen polymorphism in 70 patients. The coexpression of R314R single nucleotide polymorphism on third exon was shown in our study. Moreover, D102D, G138G, and A165A subhaplotypes and E474E, Q476Q, and D510D subhaplotypes were also shown. Conclusion: DNA sequence analysis should be a commonly used method for progress in the field of molecular genetics and for the better understanding of the FMF phenotype and genotype relationships in all populations. Heller H, Sohar E, Pras M. Ethnic distribution and amyloidosis in familial Mediterranean fever (FMF). Pathol Microbiol 1961; 24: 718–723. Booty MG, Chae JJ, Masters SL, Remmers EF, Barham B, Le JM, Barron KS, Holland SM, Kastner DL, Aksentijevich A. Familial Mediterranean fever with a single MEFV mutation: where is the second hit? Arthritis Rheum 2009; 60: 1851–1861. Touitou I. The spectrum of familial Mediterranean fever (FMF) mutations. Eur J Hum Genet 2001; 9: 473–483. Touitou I, Sarkisian T, Medlej-Hashim M, Tunca M, Livneh A, Cattan D, Yalçinkaya F, Özen S, Majeed H, Ozdogan H et al. Country as the primary risk factor for renal amyloidosis in familial Mediterranean fever. Arthritis Rheum 2007; 56: 1706– 1712. Livneh A, Langevitz P, Zemer D, Zaks N, Kees S, Lidar T, Migdal A, Padeh S, Pras M. Criteria for the diagnosis of familial Mediterranean fever. Arthritis Rheum 1997; 40: 1879–1885. Sohar E, Gafni J, Pras M, Heller H. Familial Mediterranean fever: a survey of 470 cases and review of the literature. Am J Med 1967; 43: 227–253. Berdeli A, Mir S, Nalbantoglu S, Kutukculer N, Sozeri B, Kabasakal Y, Cam S, Solak M. Comprehensive analysis of a large-scale screen for MEFV gene mutations: do they truly provide a “heterozygote advantage” in Turkey? Genet Test Mol Biomarkers 2011; 15: 475–482. Pras E, Livneh A, Balow JE Jr, Pras E, Kastner DL, Pras M, Langevitz P. Clinical differences between North African and Iraqi Jews with familial Mediterranean fever. Am J Med Genet 1998; 75: 216–219. Shinar Y, Livneh A, Langevitz P, Zaks N, Aksentijevich I, Koziol DE, Kastner DL, Pras M, Pras E. Genotype-phenotype assessment of common genotypes among patients with familial Mediterranean fever. J Rheumatol 2000; 27: 1703–1707. Dewalle M, Domingo C, Rozenbaum M, Ben-Chétrit E, Cattan D, Bernot A, Dross C, Dupont M, Notarnicola C, Levy M et al. Phenotype-genotype correlation in Jewish patients suffering from familial Mediterranean fever (FMF). Eur J Hum Genet 1998; 6: 95–97. Ben-Chetrit E, Touitou I. Familial Mediterranean fever in the world. Arthritis Rheum 2009; 61: 1447–1453. Ureten K, Gönülalan G, Akbal E, Güneş F, Akyürek O, Ozbek M, Oztürk MA. Demographic, clinical and mutational characteristics of Turkish familial Mediterranean fever patients: results of a single center in Central Anatolia. Rheumatol Int 2010; 30: 911–915. Yilmaz E, Ozen S, Balci B, Duzova A, Topaloglu R, Besbas N, Saatci U, Bakkaloglu A, Ozguc M. Mutation frequency of familial Mediterranean fever and evidence for a high carrier rate in the Turkish population. Eur J Hum Genet 2001; 9: 553– 555. Yalçinkaya F, Cakar N, Misirlioğlu M, Tümer N, Akar N, Tekin M, Taştan H, Koçak H, Ozkaya N, Elhan AH. Genotype- phenotype correlation in large group of Turkish patients with familial Mediterranean fever: evidence for mutation- independent amyloidosis. Rheumatology 2000; 39: 67–72. Tunca M, Akar S, Onen F, Ozdogan H, Kasapcopur O, Yalcinkaya F, Tutar E, Ozen S, Topaloglu R, Yilmaz E et al. Familial Mediterranean fever (FMF) in Turkey: results of a nationwide multicenter study. Medicine 2005; 84: 1–11. Berdeli A, Nalbantoglu S. The prototype of hereditary periodic fevers: familial Mediterranean fever. In: Cooper DN, Chen J, editors. Mutations in Human Genetic Disease. Rijeka, Croatia: InTech; 2012. pp. 149–166. Duşunsel R, Dursun I, Gündüz Z, Poyrazoğlu MH, Gürgöze MK, Dundar M. Genotype-phenotype correlation in children with familial Mediterranean fever in a Turkish population. Pediatr Int 2008; 50: 208–212. Gedalia A. Hereditary periodic fever syndrome. In: Behrman RE, Kliegman RM, Jenson HB, Stanton BF, editors. Nelson Textbook of Pediatrics. 18th ed. Philadelphia, PA, USA: WB Saunders; 2007. pp. 1029–1033. Topaloglu R, Ozaltin F, Yilmaz E, Ozen S, Balci B, Besbas N, Bakkaloglu A. E148Q is a disease-causing MEFV mutation: a phenotypic evaluation in patients with familial Mediterranean fever. Ann Rheum Dis 2005; 64: 750–752. Solak M, Yildiz H, Koken R, Erdogan M, Eser B, Sen T, Evirgen N, Erdem S, Arikan E. Analysis of familial Mediterranean fever gene mutations in 202 patients with familial Mediterranean fever. Genet Test 2008; 12: 341–344. Ben-Chetrit E, Lerer I, Malamud E, Domingo C, Abeliovich D. The E148Q mutation in the MEFV gene: is it a disease-causing mutation or a sequence variant? Hum Mutat 2000; 15: 385– 386. Majeed HA, El-Shanti H, Al-Khateeb MS, Rabaiha ZA. Genotype/phenotype correlations in Arab patients with familial Mediterranean fever. Semin Arthritis Rheum 2002; 31: 371–376. Inal A, Yilmaz M, Kendirli SG, Altintas DU, Karakoc GB. The clinical and genetical features of 124 children with familial Mediterranean fever: experience of a single tertiary center. Rheumatol Int 2009; 29: 1279–1285. Caglayan AO, Demiryilmaz F, Ozyazgan I, Gumus H. MEFV gene compound heterozygous mutations in familial Mediterranean fever phenotype: a retrospective clinical and molecular study. Nephrol Dial Transplant 2010; 25: 2520–2523. Pras E, Langevitz P, Livneh A, Zemer D, Migdal A, Padeh S, Lubetzky A, Aksentijevich I, Centola M, Zaks N et al. Genotype-phenotype correlation in familial mediterranean fever (a preliminary report). In: Sohar E, Gafni J, Pras M, editors. Familial Mediterranean Fever. Tel Aviv, Israel: Freund Publishing House; 1997. pp. 260–264. Demirkaya E, Tunca Y, Gok F, Ozen S, Gul D. A very frequent mutation and remarkable association of R761H with M694V mutations in Turkish familial Mediterranean fever patients. Clin Rheumatol 2008; 27: 729–732. Giaglis S, Papadopoulos V, Kambas K, Doumas M, Tsironidou V, Rafail S, Kartalis, G, Speletas M, Ritis K. MEFV alterations and population genetics analysis in a large cohort of Greek patients with familial Mediterranean fever. Clin Genet 2007; 71: 458–467. Aldea A, Calafell F, Aróstegui JI, Lao O, Rius J, Plaza S, Masó M, Vives J, Buades J, Yagüe J. The west side story: MEFV haplotype in Spanish FMF patients and controls, and evidence of high LD and a recombination “hot spot” at the MEFV locus. Hum Mutat 2004; 23: 399–406. ISNAD YILMAZ, EBRU , DİNÇEL, NİDA , SÖZERİ, BETÜL , ÖZDEMİR, KADRİYE , BULUT, İPEK KAPLAN , BERDELI, AFIG , MİR, MAKBULE SEVGİ . "Familial Mediterranean fever in children from the Aegean region of Turkey:gene mutation frequencies and phenotype?genotype correlation". 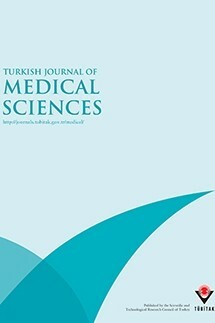 Turkish Journal of Medical Sciences 45 / 6 (December 2015): 1198-1206.